A lifetime of Donald Trump? How to fight back against his Supreme Court pick. President Donald J. Trump has laid his cards squarely on the table. He’s already started to make good on his odious campaign promises — from banning Muslims from entering our country, to building the wall on our southern border, to denying women across the world life-saving information regarding their reproductive-health care. And that’s all in just the first week. Tonight, he announced his nominee for the Supreme Court. With this announcement, we face a question as Americans: Will we be able to start digging out from the massive destruction that Trump leaves in his wake in four years, or will his agenda be enshrined for a lifetime through the highest court in our land? Our grandchildren will judge us on what we do to determine the answer to this question. Nothing less than our democracy is at stake, and with it the fate of those who need the promise of the American dream of justice and equality now more than ever. Gorsuch’s view is consistent with President Trump’s governing philosophy, which perpetually looks backward to a time when America “was great,” even if this vision of greatness means applying the social contract to the narrowest set of stakeholders possible — traditionally men, traditionally white and traditionally wealthy. What this philosophy does not do is incorporate the basic values of the framers — freedom, equality and the right to self-determination — even if they couldn’t fully imagine the scope of the constituency that their founding document would aspire to protect. Gorsuch’s narrow approach to the law is most evident in his track record on abortion access and reproductive rights. 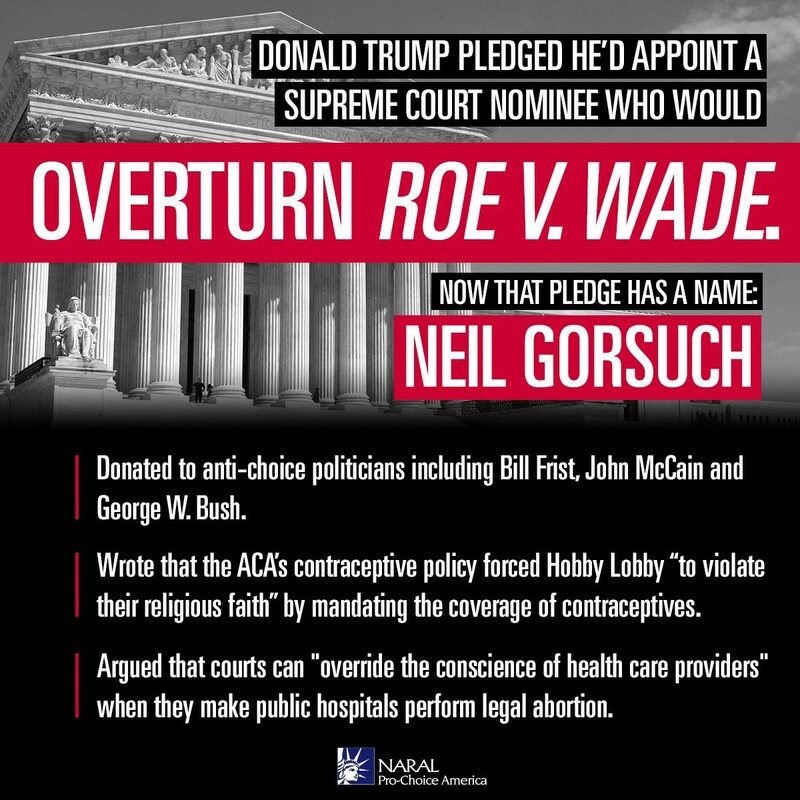 Donald Trump has repeatedly promised to appoint justices who will overturn Roe v. Wade, and we must assume that Neil Gorsuch was chosen for his commitment to unraveling our most basic constitutional rights. His judicial decisions read like a laundry list of every excuse to deny women their constitutional right to sovereign decision making and the self-determination that is fundamental to the American promise. Neil Gorsuch’s nomination threatens not only to rob women of our most fundamental rights, but also to rip families apart because of where they were born, to restrict our personal freedom to marry who we want regardless of gender and to criminalize people based on the religion they practice. Our lawmakers have a duty to make sure our next Supreme Court justice will preserve the role of the Court as an independent check on the runaway excesses of this new administration. They have a duty to make sure our next Supreme Court justice will hold dear the importance of protecting the rights of all Americans. They must not confirm someone who will work to rewrite the Constitution to satisfy Donald Trump’s agenda. Our Constitution gives us the right to make decisions about our own bodies and lives. It does not give politicians the right to substitute their own ideologies and belief for sound medical advice. Our Constitution gives us the right to practice our religious faith freely. It does not give a racist regime the right to turn people away because they are Muslim. Our Constitution gives us the right to a free and vigilant press. It does not give a wannabe-dictator the right to intimidate the media when they don’t give him flattering coverage. The next Supreme Court justice should uphold these truths. We, the people, have to hold our representatives’ feet to the fire when it comes to defending our rights and the Constitution that supports them. We have to support lawmakers who take action to prevent President Trump from using this Supreme Court seat to consolidate his agenda. We have to tell our senators that we refuse to support a Supreme Court justice who is willing to compromise our personal freedoms, whether it’s our right to access abortion or to marry the person we love. And we have to make sure that our leaders know their legacy is at stake when they make decisions about how far to let Trump push the envelope. Senator, please know that I support you in this most fundamental role of demanding a Supreme Court nominee who is truly committed to upholding the rights of all Americans and who will serve as a check and balance on this and all administrations. Please do everything in your power to protect the people and assure that bigotry is not enshrined in our land for a lifetime. The next four years will not be easy. President Trump already has the power to institute policies that will change our lives for the worse. But we cannot afford to elevate his dangerous ideology with a lifetime appointment to our nation’s highest court.